I’ve talked about bone broth fasting on this blog, and on my Facebook page. It’s something I am a huge proponent of, especially for anyone battling autoimmunity. Anytime I feel an exacerbation of symptoms coming on, I head straight to the freezer to grab some chicken bones and get them onto the stove top. One to two days of fasting always calms my immune system down immediately. Works like a charm, no steroids needed! But you don’t have to fast to enjoy the benefits of bone broth. There are countless, delicious, paleo soups you can make with the broth to keep you feeling full while still reaping the incredible, gut-healing magic of bone broth! Personally, I love to make hearty soups. Especially this time of year. Meat (sometimes multiple), veggies (as many as I can find in the house or the garden) and plenty of fresh herbs. 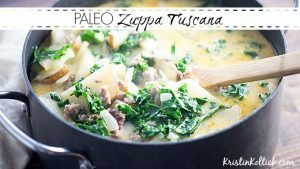 One of my absolute favorites is this Zuppa Tuscana! Brown the Italian sausage in a pan and drain. Add sausage, chicken stock, garlic, onion, carrots and potatoes to the slow cooker. Five minutes before serving, open the can of refrigerated coconut cream and add just the solid white cream to the slow cooker. Cook for 5 additional minutes.